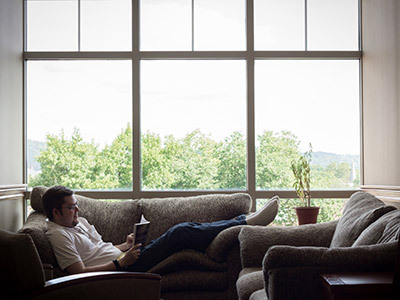 A variety of living facilities are available on campus. The Calian Residence Hall offers single living quarters with private baths. The building offers a modest physical fitness center, lounges, and a student kitchen. Calian Hall also provides space for overnight guest housing at reasonable rates. Four apartment buildings—Fulton, Highlander, Anderson, and McMillan—offer apartments ranging from efficiencies to family oriented three- and four-bedroom units. Pets are welcome in Highlander apartments and one tower of McMillan. Calian Residence Hall - Newly built, single-student housing with shared kitchen facilities, student lounges, and modest fitness center. The building is accessible with an elevator and is within the Seminary's gates. Fulton Apartments - Includes efficiency and one-bedroom units within the Seminary's gates. Highlander Apartments - Pet friendly one and two bedroom units for student families. Anderson Apartments - Two- and three-bedroom units, some with balconies, for student families. McMillan Apartments - One-, two-, three-, and four-bedroom units, some with balconies, for single or married students. To apply for student housing download and complete the application below. Mail the completed application to the address indicated on the form or e-mail to the student housing coordinator at cspotts@pts.edu. Please Note: In order to be guaranteed student housing, you must complete your application by June 1, 2018. Contact Carol Spotts, student housing coordinator, at cspotts@pts.edu with questions.